We’d love your help. 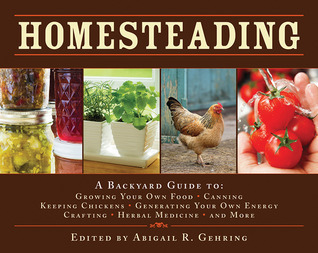 Let us know what’s wrong with this preview of Homesteading by Abigail R. Gehring. Who doesn’t want to shrink their carbon footprint, save money, and eat homegrown food whenever possible? Even readers who are very much on the grid will embrace this large, fully-illustrated guide on the basics of living the good, clean life. It’s written with country lovers in mind—even those who currently live in the city. Whether you live in the city, the suburbs, or ev Who doesn’t want to shrink their carbon footprint, save money, and eat homegrown food whenever possible? Even readers who are very much on the grid will embrace this large, fully-illustrated guide on the basics of living the good, clean life. It’s written with country lovers in mind—even those who currently live in the city. To ask other readers questions about Homesteading, please sign up. I love reading factual books and this one was no exception. This book was filled with hundreds of pages covered with invaluable information that will and has helped me improve my everyday life. I would recommend this book to any outdoorsy person or people living in rural enviroments. I saw this book at the library and checked it out because i wanted to get more information on raising chickens. Which I found out that it was way too basic of info to be of much help. I really needed detailed instructions or tips to start chicks and keep them healthy. The book told more about how to build a chicken coop... which i didn't need. but overall it was really quite interesting - even soap making recipes and canning foods recipes! Emphasis is on breadth rather than depth. This is the worst how-to book for homesteading/gardening/raising livestock/building/etc that I have ever read. You will get more useful information by getting a children's picture book on 'Clifford Goes to the Farm' than from this book. Information here is either sketchy, not there, outdated, or just plain wrong. In the first aid section (and I'm still not sure why a homesteading book has a first aid section), it tells you how to put on a tourniquet! That's right next to the picture from the 19 This is the worst how-to book for homesteading/gardening/raising livestock/building/etc that I have ever read. You will get more useful information by getting a children's picture book on 'Clifford Goes to the Farm' than from this book. Information here is either sketchy, not there, outdated, or just plain wrong. In the first aid section (and I'm still not sure why a homesteading book has a first aid section), it tells you how to put on a tourniquet! That's right next to the picture from the 1939 Boy Scout Handbook on how to carry an injured person. Really?!? Oh, and if you're going to make yogurt - good luck following the instructions here. I've made yogurt for years and can tell you that the recipe/instructions are wrong and bordering on stupid. Same for the build-your-own-barn 'instructions' and the home canning/freezing guides. If you want a catalog of things to go study, an idea cache so to speak, then this book is fine. If you want a guide to the things this claims to guide, then you really want Seymour's "The Self Sufficient Life and How to Live it." It covers roughly the same turf, but it is written from the position of experience. This book feels like it is written by someone who just googled each topic and did a summary of what she found. This is not inherently bad, but it makes the book much less useful than it s If you want a catalog of things to go study, an idea cache so to speak, then this book is fine. Good book. She starts off with an excited interesting tone, but then looses it half-way through the book. Or well, i lost interest when i found out that low acid foods require more labor to can and more equiptment, for instance the pressure cooker needed to take care of bacteria. Guess i'll stick with drying vegetables for now. But at least i didn't waste money on the wrong kind of canning kit. I would recommend the digital copy because the size of the book was very inconvenient. When you open i Good book. She starts off with an excited interesting tone, but then looses it half-way through the book. Or well, i lost interest when i found out that low acid foods require more labor to can and more equiptment, for instance the pressure cooker needed to take care of bacteria. Guess i'll stick with drying vegetables for now. But at least i didn't waste money on the wrong kind of canning kit. First off, if you read this book cover to cover, I am pretty certain you would go blind because the type font is freakishly small. Information is distributed somewhat unevenly -- cursory info on growing plants for food but a huge chapter on canning? How am I supposed to grow enough to can anything? The book does serve as a good overview of a lot of ideas, but should probably be seen as a jumping-off point, rather than a definitive guide. This is not the book most people will pick up for a casual read, but I'm a glutton for information. :) The book is packed with useful information that I recommend for anyone interested in gardening, self-sufficiency, and better, greener living. This is the kind of knowledge that doesnt get passed on from generation to generation much these days as we become increasingly more an urban culture. A must read in my opinion. I cannot even give this book a chance, because the text is too small to even think about reading. It's crazy small. Hopefully I'm not missing any valuable information. I think this book is trying to cover too much, and from briefly skimming it, it seems like it cannot cover any topic in depth. Better to get a book on beekeeping if that's what you're into, or generating your own power, or canning, etc. One book for all these topics could not do justice to them. This book is a great overview of the many different things a person who wants to start their own little back yard farm needs to know. Its a great starting point if you want to see the different options you have if you want to do a little homesteading. Covers growing , canning preserving veggies & chickens, sheep,wool, shearing, energy systems,building a stanle, chicken coop, bee keeping and a lot more. OMG this book is self-sufficiency pr0n. I was already getting a bit nutsy about making local, sustainable food, making my own bread, learning to make my own cheese. This book makes me want to raise my own chickens and goats, make my own yogurt, basically move to the country, start a farm, and do my own everything. All with gorgeous pictures! No room for details on anything--if you actually want to do any of this stuff, get a book on it. But lots of fun for dreaming. I didn't expect much from such a short book claiming to cover so many topics, but - wow! This could be a very handy reference book with a lot of helpful quick tips on things ranging from canning food to making compost. Many of these activities I will probably never try myself, but this is a good way to get a quick look at how much might be involved in that random new hobby you're considering. A lot of really useful and interesting information in this book, from growing plants in your garden to making your own cheese to alternative energy sources to recipes for homemade lip balm. Basically a broad view of each topic, but there was enough information to get a start with and determine if it's something you really want to delve into. Esthetically pleasing, perhaps inspiring, but not particularly in-depth. Many topics are covered including solid advice, but this should be viewed as more of a coffee table book than a reference book overall. Tons of pretty pictures and enough information to get someone started on various projects, but yeah, probably a lot like many other similar books out there cashing in on "the dream". Skimmed through most of it, but spent most of my time looking through the edible wild plant section and checking out the handy companion planting chart. Unfortunately, it has to go back to the library today. Well worth looking into, especially if you've already read "Back to Basics" by the same author. Not deep knowledge on any subject, yet still a fantastic overview of a homesteading life, and with doable projects whether your idea of your homestead is a tomato plant in a bucket on the patio or an off the grid, water collecting, solar powering grow your own food, animals and animal feed providing sustainable farm. Lots of fun info, and shortcuts to do most projects on a budget. Love!! Has a step by step process on how to gradually get off the grid (or find the right place on the grid) w/out going cold turkey. Describes how to make your own energy, food, shelter and how to even be an *urban homesteader*. Very easy and enjoyable read. Love the illustrations and diagrams. A good beginner book to have on your shelves if you are interested in living off the land. It has a little bit about everything. I was especially enamored by the canning section. The pieces are short and easy to digest. If you're really about to homestead then you'll need other books to flesh out the brief coverage of topics in this one, but still a good overview and fun book to have. This is a great book for anyone who thinks they might be interested in doing more for themselves. 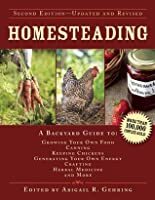 It's not in depth or a true guide to doing much as it claims-but it gives a great overview of many homesteading things. It's a good book to see what is out there so you can read other books that are more in depth. I did not like this as much as other homesteading books I've read, but it's still a useful book to give you a start. Whether you are trying to live more sustainably in the city or completely off the grid, this book won't be your Bible, but definitely a useful Cliffs Notes. A broad overview of home craft ideas; visually appealing photos and diagrams. Includes growing and preserving food, simple constructs for energy conservation, crafts, and do-it-yourself projects. A little short on information for each topic, similar to other self-sufficiency books where it seems too much is addressed minutely. Half the book is made up of images and charts, which also lessens the space for details. I borrowed this book from my local library. This book was ok as far as an overview. There were too many topics and not enough depth. I didn't read the entire book. I skipped over the subjects I didn't care about. There were lots of errors in the kindle version. So many inspiring ideas and helpful information. A pleasure just to look at the pictures about a range of activities that one can do - from cooking, canning, keeping livestock, crafting, and taking care of oneself. Overall good general resource. Strength/value lies in thorough canning section, wild edibles photos, and off-the-grid plans and ideas. Lots of photos and diagrams. There is even a craft and well-being section! A good one to have on the shelf of a committed/novice homesteader.